Shio-koji 塩麹 is my new obsession! Koji（麴）is rice that’s been inoculated with the koji mold, it is an ingredient that has been used for centuries in Asia to make soy sauce, soy bean paste, miso and wine, When koji is combined with water and salt and allowed to ferment, it turns into shio-koji or salt koji. I bought two bottles of Shio-Koji during one of my recent visits to Mitsuwa and couldn’t stop using it since. 1. 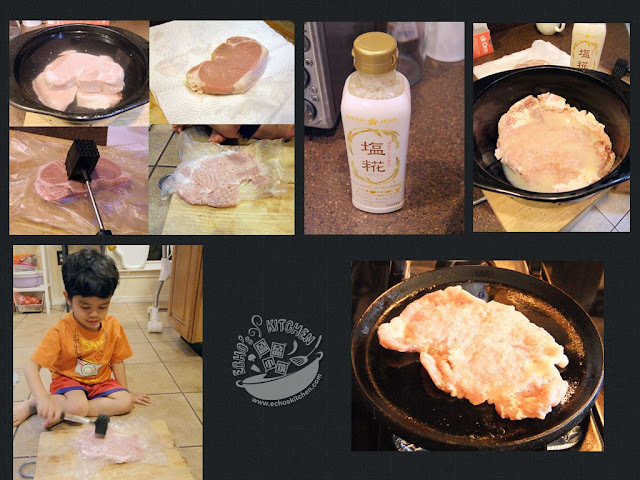 Soaked pork chops submerged in a pot of cold water with a pinch of baking soda for 10 minutes. This is to reduce the “porky" smell of pork chops. 5. 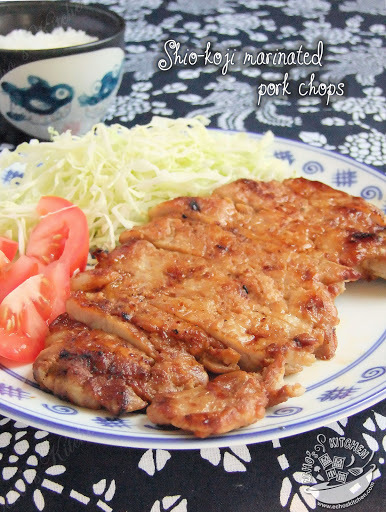 Pan-sear the pork chops at medium low heat with little oil until both sides turned golden in color, slice and serve with shredded cabbage, tomatoes and some steamed rice. 1. 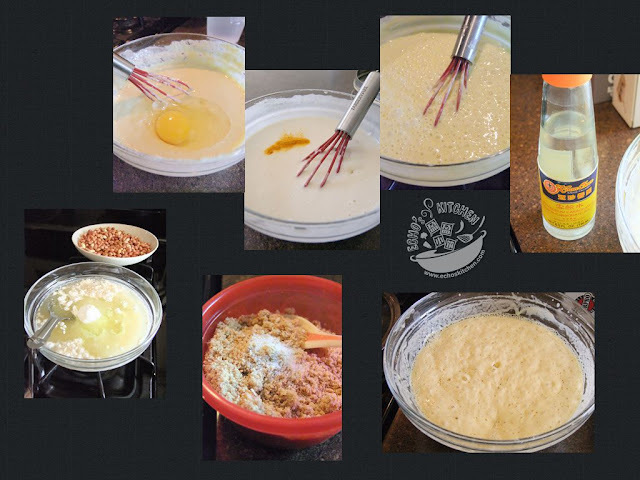 Whisk together all purpose flour, sugar, salt, yeast and egg to form a sticky batter, add a pinch of turmeric powder or 1 drop of yellow food coloring. Cover the batter with clean cloth and let it rise for 30-45 minutes, until the batter become bubbly and is smelling a little sourish. 2. Grind roasted peanuts, almonds and sesame seeds with sugar and salt into granulates/coarse powder. 3. Add the lye water and whisk the batter until well incorporated. 4. 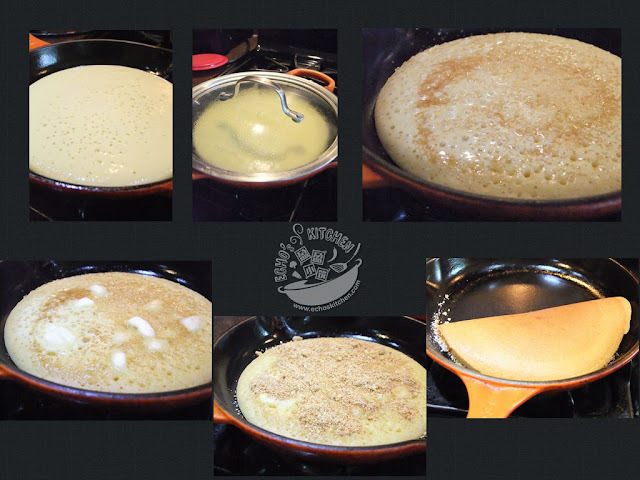 Heat up a griddle/cooking pan, brush a thin layer of butter, add and spread 1 cup/240 ml of batter in the pan, with a lid on, cook at medium low (number 2) for 3-4 minutes until bubbles appear on top. Divide 1 tsp of butter into few portions and drop it all over the pancake, spread the peanuts, almond mixtures over the pancake. 5. Cover the pancake with lid again and cook on low for 2-3 minutes, fold the pancake into half and spread a thin layer of butter over the it. 1. Sear salmon and cut it into cubes. Chopped/cut carrots, chopped some scallion for garnishing if you like. 2. 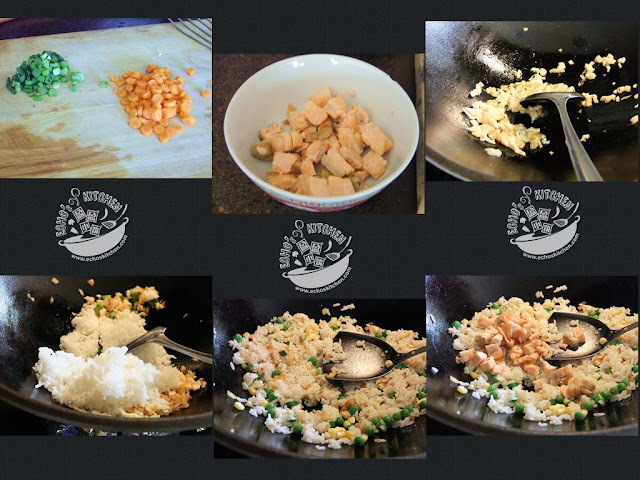 Heat up 1 tbsp of oil in a wok/pan, cook chopped onion until translucent, add rice, loosen the rice up using a spatula. 3. 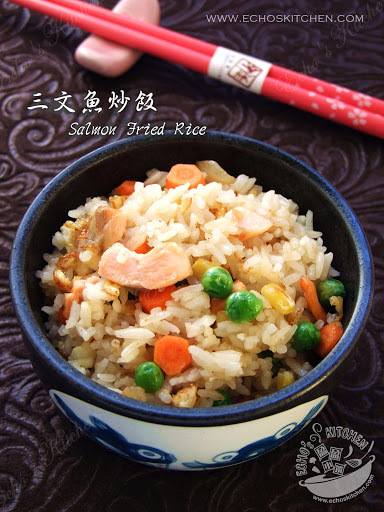 Add salt, peas and corn, stir well at high heat, cook for 2-3 minutes, add salmon pieces, continue stirring for 1-2 minutes, drizzle a little sesame oil and a pinch of pepper powder，garnish with scallion before serving. I started making yogurt at home few months back since I have a steamer that comes with yogurt function. 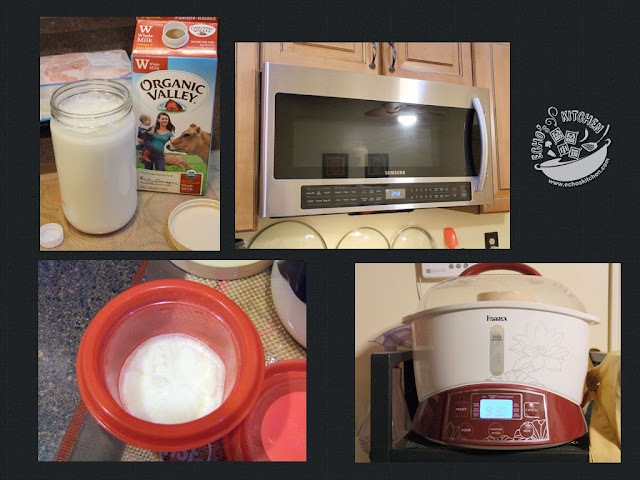 Making yogurt at home is pretty easy, you don’t really have to invest in a yogurt maker or steamer, there are many incubators you can try on, such as a thermos, crockpot, covered container, a microwave, heating pad. 1. Clean and sanitized the glass jar, air dry. 2. Add milk in the jar and microwave for 4-5 minutes until the milk becomes hot. 3. Let the milk cool to around 110 degrees fahrenheit (50-55 degrees celsius), warm to touch and higher than body temperature it is. 4. Stir in yogurt starter, stir well to make sure the starter is thoroughly incorporated into the milk. 5. Loosely cover the jar with lid and place it into the steamer, start yogurt making function. Heat one gallon of water to 110 degrees F(50-55 degrees C) and pour into a cooler. Shut the cooler lid and leave in a warm place for 7-9 hours until thickened. 6. Scoop out 1/4 cup of the freshly made homemade yogurt, place in airtight container and freeze it.Note: Thaw at room temperature before using it to make your new batch of yogurt. Freezing the starter from the freshly made yogurt will ensure the most active cultures are being saved. In other word, will almost certainly ensure a workable starter as long as needed. Stored the remaining yogurt in refrigerator for consumption. 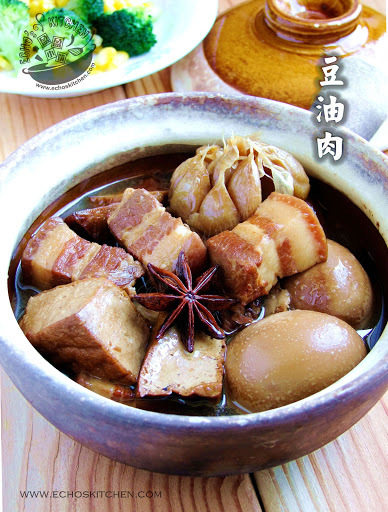 I gotta insist that one pronounce the name of this dish in Hokkian (Minnan), light soy sauce is called “Tau Yu" and meat in Hokkian is called “Bak" thus the name of this dish, Tau Yu bak means meat braised in light soy sauce! It is a very typical Hokkian/Minnan dish and the recipe is often heritage and passed down from mother to daughter, so you can now guess where I got mine from! 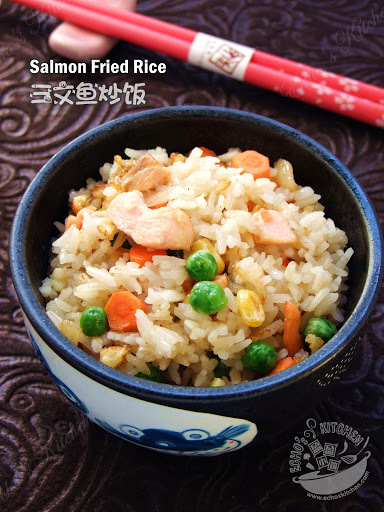 My dad’s favourite way to enjoy this dish is to drizzle the gravy over steamed rice and mixed before digging in. I did the same for my son A and he had a big bowl of it! 1. Heat 1-2 tbsp of oil in a cooking wok, add rock sugar and stir until dissolved and caramelized. Add pork belly and stir until it changes color, add whole garlic, cinnamon/bay leaves and star anise. Meanwhile, boil the eggs and remove shell. 2. Cut the tofu cutlets into triangular in shapes, add the tofu into wok and stir cook together with the rest of ingredients. Transfer the content in the wok to a cooking pot, add enough water to submerge all ingredients, season with light soy sauce, caramelized soy sauce, bring to boil and turn to medium low, cover with lid and cook for 20 minutes. 3. 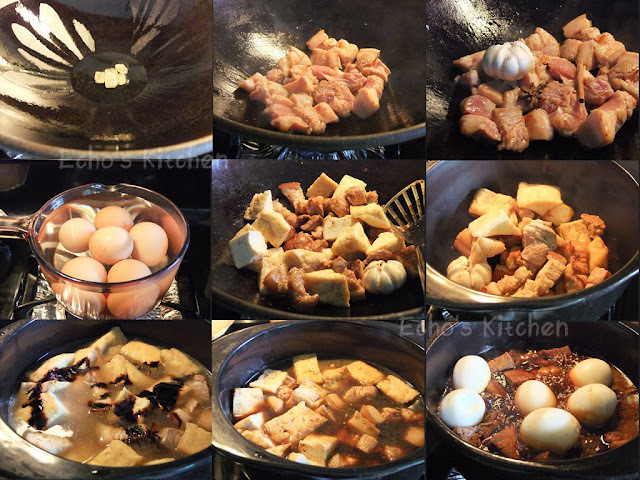 Add hard boiled eggs and cook for another 20-30 minutes until the pork belly become tender. Add a little white pepper powder, adjust taste with salt if you needed. 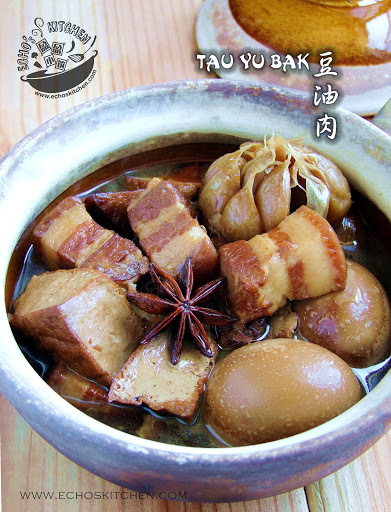 Switch off the stove and let the braised pork steep for another half hour before serving. Samosa is a stuffed pastry, a common snack in India, we have a similar version in Malaysia called “curry puff" made in different shape, but tasting as good. 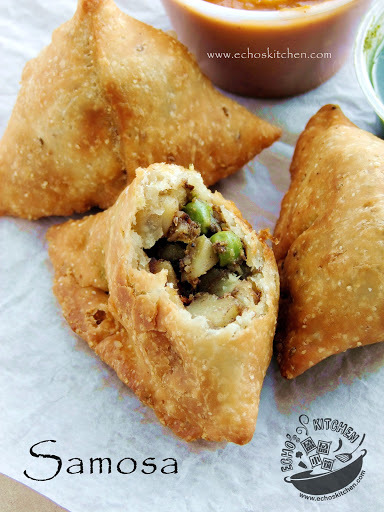 Nothing is more enjoyable to have some hot samosa with a cup of tea in a cold, cozy afternoon. 1. Wash and pressure cook potatoes for 5 minutes, let the pressure release naturally, this will let the potatoes continue to cook a little more.2. Remove the potatoes from the pressure cooker, place it under cold running water to cool, peel the skin and cut it into small cubes. Prepare other ingredients accordingly, finely chopped green chillies and coriander leaves. 3. Heat up 2 tbsp of oil in a cookware, fried cumin seeds until it starts crackling, add chopped green chilies and green peas, stir for 1 minute, add coriander powder, garam masala and salt. 4. 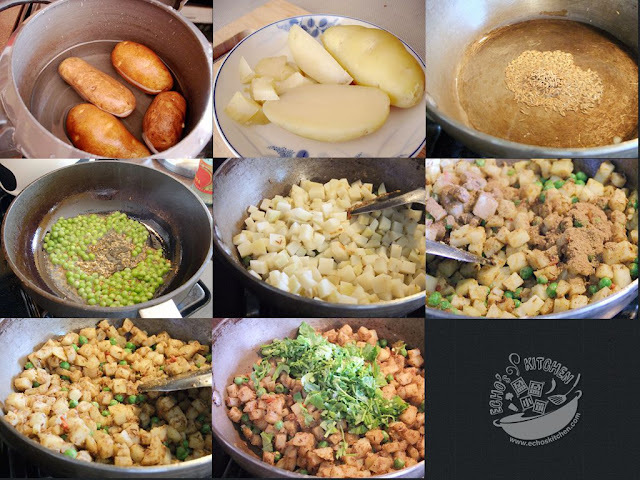 Add the potato cubes, stir well and cook for about 8 minutes, use a potato masher to press the potatoes a little if you like. Add dried mango powder and chopped coriander leaves, mixed well and let cold. 5. Knead together all purpose flour, semolina powder, salt, butter/ghee and lukewarm water to form a stiff dough. Cover it with a damp towel, and let it sit for about 20 minutes.6. Take the dough out and knead it a little more, divide the dough into 6 equal parts and roll them into balls. 7. Take one ball and roll it out into an oblong shape, do not use any flour or oil while rolling. Use a knife to cut the center part to make it into two semicircles. 8. Lightly spread some water at the edge of the semicircle using a brush or your fingertip, pick it up and seal the straight side by pinching the edges together to form a cone. Turn the sealed side towards you and the round circumference side at the opposite. 9. Fill the cone with potato filling, press the filling down as much as you can so that the samosa will not be hollow after frying. Make a small fold over the circumference side right opposite where the straight line was sealed just now (See picture). 10. 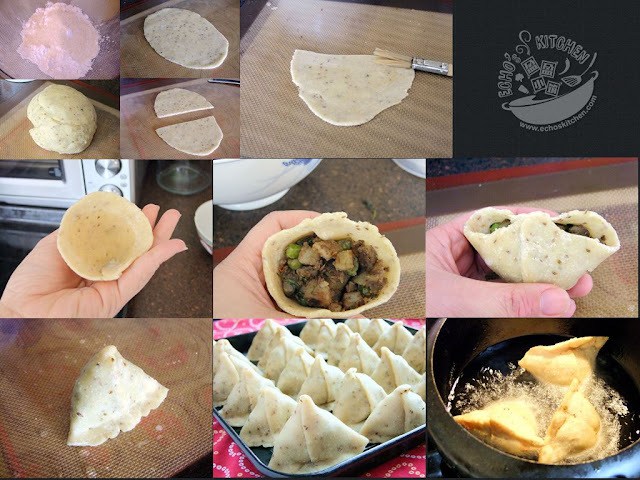 Join both the opposite side of folds in the middle and slowly pinch and seal the samosa from the middle alongside the opening to seal it completely. 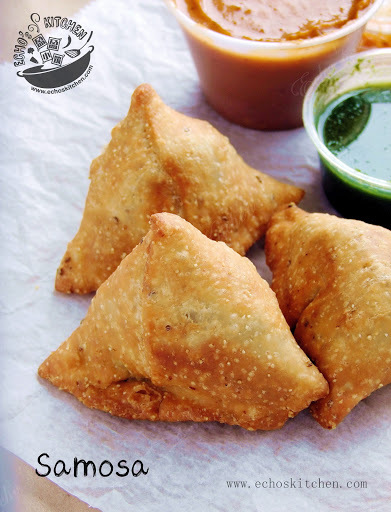 Once it is properly sealed, you can then place it on the countertop and shape the samosa into a triangular shape. Repeat the same steps for all the remaining dough and ingredients. 11. Heat 2 inches of oil at medium heat and fry the samosa until golden brown. Drain and serve warm with Ketchup and green chutney.